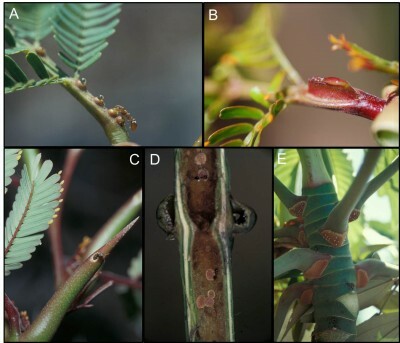 Abstract: Ant–plant interactions are classic examples of defensive mutualisms and have served as model systems to study the ecology and evolution of mutualisms since the 19th century. Ant–plant mutualisms range in specificity from myrmecophilic (ant-loving) plants, which attract free-living ants to obtain defense against herbivores, to obligate myrmecophytes (ants–plants), which provide specialized structures such as shelter and, in most cases, food rewards such as extrafloral nectar (EFN) and food bodies (FBs) to specialized ants. These ants usually cannot be found nesting outside of these plants. Myrmecophytic plants house and nourish ant colonies to establish obligate, long-term interactions. In return for food and shelter, the symbiotic ants mainly defend their host against herbivores and pathogens; in some cases, they supply nutrients. Here, we will review the anatomical and physiological features of the rewards that myrmecophytes provide to ants: EFN, FBs, and domatia (shelter). The anatomical and chemical features of these rewards match their physiological and ecological functions to attract, feed, and house ants. Recent studies in several systems demonstrated how the chemical composition of these rewards and spatiotemporal patterns in their production ensure their optimized exchange among specialized mutualistic partners and reduce the exploitation risk by nonreciprocating species. However, it remains to be studied how the production of rewards is regulated by the plant and whether it represents a specific plant response to the presence and identity, or rather the concrete actions, of the symbiotic ant partner. More research is needed, particularly with respect to the production and formation of domatia, which have been far less studied than EFNs and FBs. In obligate defensive mutualisms, a feedback between host plants and resident ants, in terms of the benefits they provide each other, it is likely to occur.